In 1986 JOE SATRIANI released his first solo album through Relativity Records, Not Of This Earth. 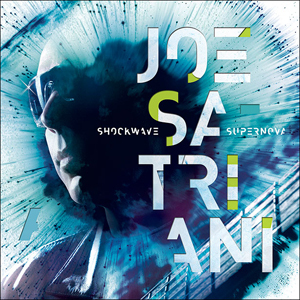 Fast-forward to this year when SATRIANI released his 15th solo album, Shockwave Supernova to critical acclaim. To mark this major milestone anniversary, SATRIANI will bring to life the “Surfing to Shockwave” 2016 Tour, an evening spotlighting his 30-year career. The 45-date tour celebrating “30 Years of Mind-Bending Guitar Daredevilry,” a phrase coined in a June 2014 career-defining retrospective feature in Rolling Stone, launches February 25th at Seattle’s legendary Paramount Theatre crossing the US into Canada ending April 24th. The shows will highlight music over SATRIANI’s entire career, including songs the legendary guitarist hasn’t played live in over 20 years! Check out the official tour trailer below! This August, the world renowned guitarist released his 15th studio album, hitting Satriani’s highest chart debut at #19 on Billboard’s Top 200 Current Albums Chart. In addition, the album also debuted at # 3 on the Billboard Rock Chart and ranks as the highest charting all-instrumental rock album on Billboard’s Top 200 in the SoundScan era. For two decades, the guitar virtuoso has traveled the world, playing to sold-out crowds as both a headliner and as founder of the all-star “G3” guitar extravaganza. Satriani’s studio and live recordings have sold more than 10 million copies worldwide to date and of his many solo albums, two have gone platinum and four others went gold, with 15 Grammy nominations between them. His side project, CHICKENFOOT, featuring former VAN HALEN front man Sammy Hagar, former bassist Michael Anthony and RED HOT CHILI PEPPERS’ drummer Chad Smith saw their debut album certified gold and their second studio album debuted at #9.